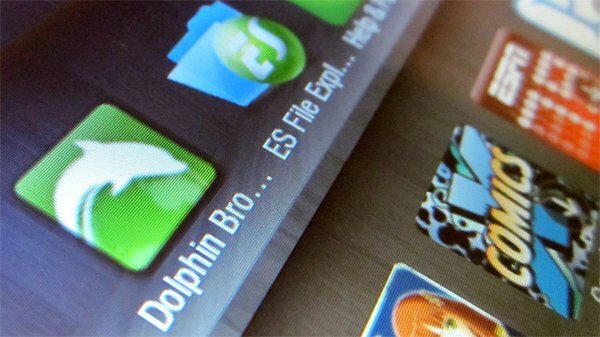 By Ryan Whitwam on Nov. 17, 2011 at 7:58 a.m.
Get your must-have apps on the Fire even if they aren't in Amazon's Appstore. So, you’ve got a shiny new Kindle Fire, but your favorite app isn’t in the Amazon Appstore? Since the Fire lacks access to the Android Market, you’re just out of luck, right? Nope. 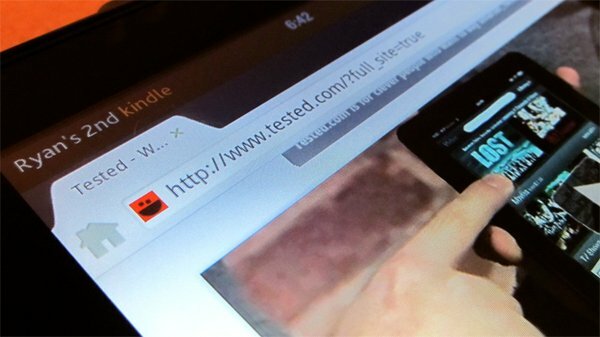 Amazon was good enough to leave the frameworks in place to allow sideloading of apps from other sources. It’s not the most straight forward process, but that never stopped us before. it might take you a few minutes, but there is enough of Android filling the Fire's cracks to make this a quick fix. Read on as we go over how to expand your Kindle Fire’s app selection in just three steps. There are a few ways to get the APK for the app you want; in this case we’re using Dolphin Browser HD, which you can’t get in the Amazon Appstore. The easiest way is to use an Android phone to download the app you need from the Market. Just install it like any other app, then make sure you've got a separate app that will let you backup your target. We use Astro File Manager for this. 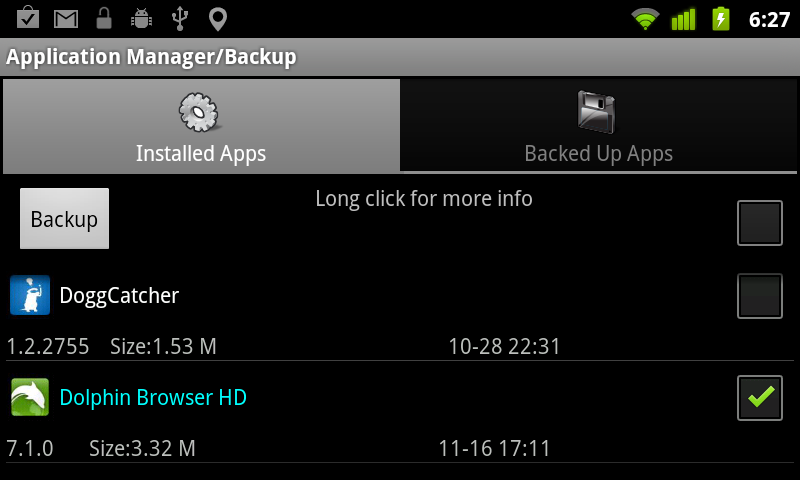 In Astro, go to Menu > Tools > Application Manager/Backup. Then scroll through the list that is pulled up, and tap the check box for your target app, and hit Backup at the top. The APK will then appear in a folder on the SD card called simply “Backup.” The next step is getting that file off the phone. We like to use Dropbox to push files to the cloud and desktop at once, but you can also email the file to yourself, or just plug your phone into a PC and copy the APK over. 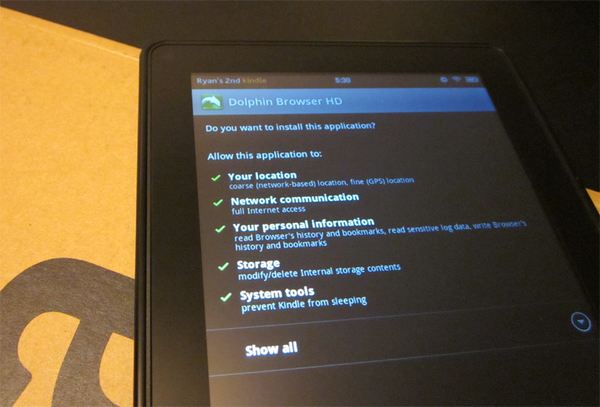 The Kindle Fire’s main system settings are pulled up in an unusual way. Tap the quick settings area in the upper right corner of the device. In the drop down, choose More. This screen will feel much more like the Android we know with some familiar options like Display and Security. Scroll down until you find Device, and click through. Down at the end of this list is the item we’ve been looking for, without which this whole endeavor would be impossible. Toggle “Allow Installation of Applications from Unknown Sources” to on. This, despite the bizarre wording, does the same thing that the Unknown Sources toggle in regular Android: it lets you install APK files outside the default store. There won’t be any discernible change, but the device just got more open. Before proceeding, you will also need a file manager of some sort on the Fire. Pop on over to the Amazon Appstore with the App link at the top of the home screen. Search for “file manager” and take your pick here. We used ES File Explorer for this process. Plug the Fire into a computer and it should pop up as a USB drive. Find your target APK file and move it over to the Fire. Then you just have to do the usual song and dance of ejecting and disconnecting the Fire. Now hop back over to the Fire interface, and you should have the link for your file manager in the carousel on the home screen. Open it up and find the APK you just moved over. Select it and you’re going to get booted to a screen that looks very much like the system-level app installation screen in Android. 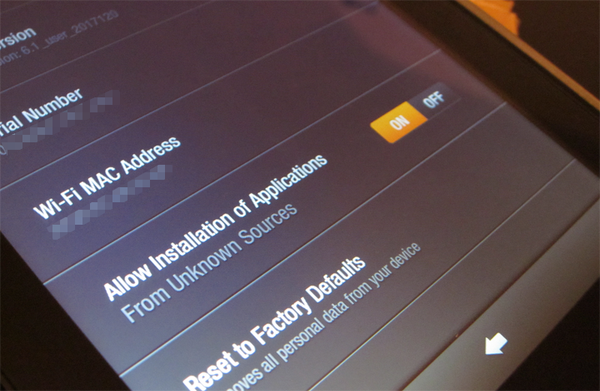 It has all the permissions laid out so you can make sure everything looks good, just like stock Android. Hit the Install button at the bottom, and it’s all done. Your app is now installed, so go ahead and launch it to see if it works properly. Not everything will run on the Fire, but most of its Android lineage is intact, and we’ve had good results so far. Paid apps from the Market won’t authorize properly, so that’s out. Additinally, any apps that call on functions that don’t exist on the Kindle will crash. For example, home screen mods, GPS apps, and phone-related apps will pull up errors. Dolphin Browser HD works just fine on the Fire, and offers the same great experience we’ve gotten used to on Android phones. All the functions in Dolphin seem to work, and it’s plenty responsive. The only thing that tips us off that the app isn’t meant for the Fire is the super low-resolution icon on the home screen. Once you get this process taken care of the first time, it’s much less painful the next. Let us know what apps you’ve sideloaded if you’ve got a Fire, and how that’s gone. Some users report success with GetJar, but we haven’t been able to get that up and running as of yet. Does sideloading make this device more interesting to you?